As the newest addition to our collection, this beautiful home has a contemporary Moroccan flair, and an amazing view of the entire city of Los Angeles. 30' of glass opens to a 50' deck. Fully modernized with 50' TV and double sided fireplace which serves both the living room and bedroom. The master bedroom's soft partitian surrounds the fireplace, allowing for a premier master suite. This is the perfect place for writers and artists to work and relax in a creative environment, while still being able to take advantage of all Los Angeles has to offer. Moments up the hill from Hollywood's hottest attraction, this retreat will be your favorite place in all of LA. The Modern Villas Hollywood have been home to many wonderful artist such as Stevie wonder, John Travolta, Danny DeVito, Jesse James, Kat Von D, Eddie Van Halen, Blake Shelton, Miranda Lambert, Tom Ford, Annie Liebovitz, Carrie Elwes, Mark Canton(creator of the movie 300) Ryan Cavanaugh, Stanley Tucci, just to name a few of the wonderful artist. Additional Services Available! : Additional housing for friends, family, and employees are available in adjacent properties. Please contact owner to reserve! Utilities charged on stays of 30 days or longer. Owner is in the entertainment industry in addition to being a passionate and experimental builder. He is famous for his architectural innovations, attention to detail, and the fit and finish of his properties. He wants the house to be enjoyed, and loves sharing his deep knowledge of the local restaurant, nightlife, cultural and music scenes with guests. He sees his design work as creation of experiential art designed to facilitate a stress free and sensually fulfilling lifestyle filled with aesthetic stimulation and the simple pleasures of spending time with friends and family. This house is situated in the playground of the rich and famous. The Hollywood Hills area is home to the most beautiful people in the world, and this property is ideally situated to take advantage of the shopping on Rodeo, a night out on Sunset, and world class restaurants and cultural institutions. You may have heard nightmares about the traffic in LA, that will not be an issue as everything worth doing is right in this area. As you ascend the drive to this Morrocan Contemporary you will feel your everyday worries falling away, when the door opens you will know you are home in the house you always dreamed of...if only for the night. Available also as a three bedroom 3 bath, two kitchen home with Contemporary Retreat (see VRBO L#309766.) The two homes when booked separately are entirely private. Then the sun set, the lights were turned on and magic happened. The space, is almost spiritual. The daytime views nice, but the night time view, STUNNING. The pictures cannot do them justice. We spent three nights in this lovely place and by the third day we were so sad knowing we would have to leave in the AM. We went on to spend 7 days in Palm Springs and I can genuinely say our time in this space was BY FAR our best and most treasured memories. The house is a short distance (5 miles can take 45min in LA...but still LOVE it!!) to lots of hiking. We did the Griffith Observatory on day and the Hollywood Sign, (front & back!,) the other. Both hikes were less than 5 miles away. We spent a day on Santa Monica Blvd. in the restaurant/bars of West Hollywood and had the time of our lives. The bed was SUPER comfortable. The water pressure in the shower was perfect (two very important things for me!). They had everything you would need to be comfortable, and if you needed anything, or couldn't find something James would be there in ONE MINUTE to help. He was great!! I would go there again in a heartbeat!! Thank you so much for having us and allowing us to have the amazing memories we now hold dear! We had a very nice stay at this home which offers spectacular views along with easy access to the Hollywood Bowl, West Hollywood, Beverly Hills and surrounding areas of interest. We highly recommend this experience. Amazing view from the balcony!!! Owner was extremely helpful and nice!!! It had everything we neede!!! Very charming and cozy vacation rental in the Hills away from the all the hustle and bustle of Hollywood. If you're looking to find a little peace and quiet in the city then look no further -- this is the place. I just love the energy of this space! It was absolutely perfect for me traveling solo & the views really are as outstanding as everyone else previously mentioned. My wife, son and I spent a week here and loved every minute of the stay! The views were astounding and even my cousin, who lives in West Hollywood, was amazed with the views. 1) the view cannot be captured accurately in photos - it's much better in person! 2) the location is great. While it's not truly a walk to everything due to the hilltop location, you are literally a 10 minute drive to the Hollywood Bowl, Hollywood, Sunset strip and West Hollywood. It's a 30/50 minute drive (traffic dependent) to Venice, LAX, downtown LA and Malibu. 4) no bugs! We come from the Midwest where mosquitos are horrible. Here, we slept with the 30 foot window open and had no problems. 5) James and Lisa are extremely professional. We met James briefly upon arrival and he was very cordial and fun to talk with. 6) The bed was comfortable. 7) James was very responsive to questions and requests throughout our stay. 8.a) some of the outdoor linens were slightly sun worn (discolored) but they functioned perfectly. Oh yes, the daybed on the patio was really relaxing both day and night. 8.b) the hot tub needed to be run a day or so to get clean but, again, was of very minor concern. 8.c) the air conditioning was a window type and in the bedroom. Coming from hot and humid Chicago, we thought this would be a problem but it, the three fans and the cool nights were perfect and we actually used blankets to stay warm. Would I stay here again? Yes, in an instant! The owner is wonderful and it's one of the most unique places I have stayed in all of our journeys. My wife actually stayed home for a day simply to enjoy the view and solitude while I took my son to visit a college. Did a weekend girls trip here and it was stunning!! Beautifully designed and very cozy - perfect size for the three of us. None of us had ever seen a view quite like this. Lisa was always available by email if we had any questions. Thanks for a great trip! We appreciate your being such great guests. Come again! 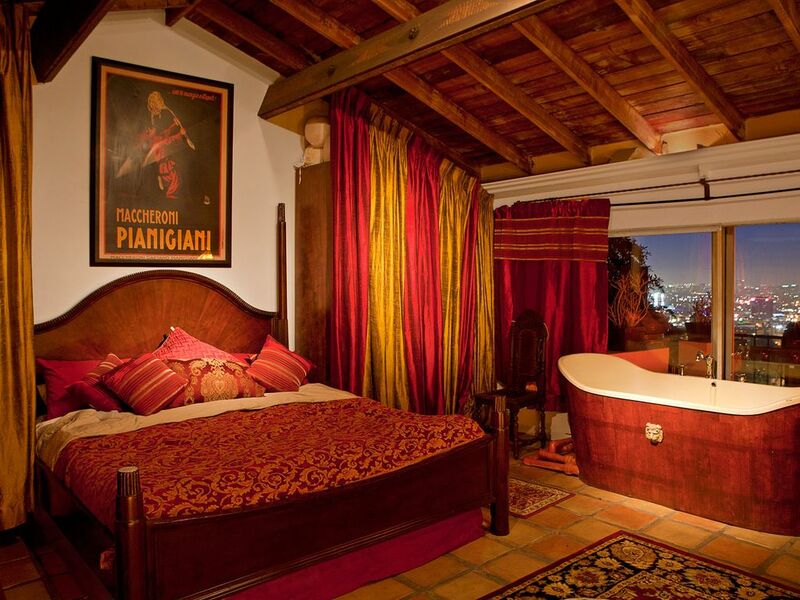 The Hills Moroccan Casbah Contemporary sits above all of Hollywood amongst a celebrity filled neighborhood. Our homes are built by, and lived in by artists and celebrities, and we pride ourself on providing a creative environment for those who wish to be inspired. Shorter stays are available upon request. Security deposits and rates are dependent on the number of occupants and proposed use. Event rates are available upon request. Higher holiday rates apply. Please contact owner directly for these rates.